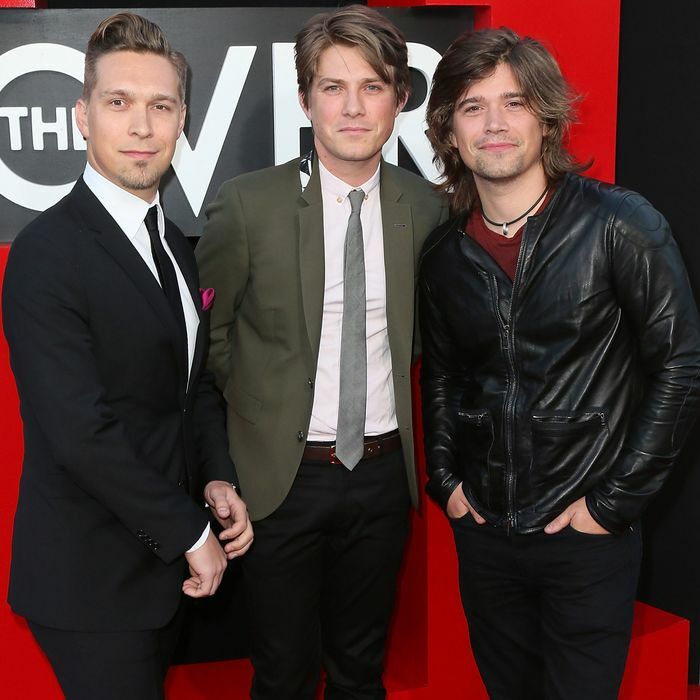 Left to right: Isaac Hanson, Taylor Hanson, and Zac Hanson. Children of the ‘90s, prepare to feel really, really old: Twenty years ago this month, three towheaded, harmonizing brothers from Tulsa released the original version of one of the most inescapable songs of the decade, Hanson’s “MMMBop.” (We’re talking the original self-released demo, which was rerecorded later in ‘96 with the Dust Brothers for Hanson’s 1997 four-times-platinum major-label debut, Middle of Nowhere.) Zac, Taylor, and Isaac have kept busy since then, with six studio albums, their own record label, an annual songwriters’ retreat (Fools Banquet), and, now, a beer company (flagship brew: Mmmhops) and attendant music fest (the third Hop Jam, headlined by Edward Sharpe and the Magnetic Zeros, happens in late May). Right now they’re producing and working on some new music (a new album for next year might be in the offing). Perhaps more important, though, they were willing to talk to Vulture for a full hour about nothing but “MMMBop” memories. Can you believe it’s been 20 years since the “MMMBop” demo came out? Taylor Hanson: We were talking about the fact that the particular date is funny. It was released that spring, and that year was really a landmark for us; the album that was made was supposed to be our independent, next push for the local fans. We didn’t think of it as a demo — this was our next record. And then we got signed that year. We were going to keep building our local fanbase, and then after being turned down by every record label there is multiple times, it was what that record contained that actually ended up getting us signed. Do you have a sense of why you were getting rejected so much? T.H. : I mean, we were a young group of guys with long blond hair singing Jackson 5–esque soulful songs, and in the mid-’90s everything was grunge; it didn’t make sense to anyone. We weren’t deterred by that, which is why we went from A&R person to A&R person until the president of Mercury was like, “We passed on this?” I think “MMMBop” stood out. To us that was truly a garage record — it was us in a very small one-car garage, doing album-creation stuff at the ages of 10, 12, and, like, 14. Isaac Hanson: 14? Golly, right. T.H. : We ended up mixing it with some of the guys who worked on the earlier Cracker stuff, had a connection with the Hootie & the Blowfish world, the bands of the moment at that time. Are there ways, looking back, that you see “MMMBop” as a template for what a Hanson song would be like? I.H. : Trying to find the optimism. T.H. : Exactly, but it’s an optimism that’s framed with realism. I.H. : We used to always tease that we write happy sad songs. Maybe some of that came from listening to a lot of old R&B and rock and roll. Do you think people realized “MMMBop” was actually this darker song? T.H. : I think a lot of people did not. And that makes sense. But hopefully over time, the staying power of that song is about the fact that it’s more than it looks like at first glance. That hook is what gets you in, but what’s below that is what keeps you there. The original version sounds fairly different from the ultimate Middle of Nowhere version that the Dust Brothers worked on. Z.H. : I’m pretty positive that That Thing You Do took its story line from “MMMBop” and us. I’m kidding, but they do speed the song up! And “MMMBop,” the original version, started slow, and by the end it was up to the tempo people know the song at. T.H. : Remember, we made the record at a very young age, and then we got signed, and we were happy to be signed, but we were also attached to what we just made. What the Dust Brothers heard in us were those R&B undertones, and we’d swung more towards the garage-band side of our band, because we were really playing instruments. I.H. : “MMMBop” took about a year to actually get completed. The chorus idea had really been around for a long time, and then we built the song around it. T.H. : So we had a conversation about what the song was, and how to keep that, but how to also bring in the element of a groove. And we sat around with them in their studio house in Silver Lake and talked records. At first it was a very long discussion of “Are we really going to take out the sincerity of the song?” But we ultimately fell in love with it. And Stephen Lironi, who really doesn’t get enough credit for producing that whole album, really helped shape it into what it finally became. There’s this documentary about Picasso that I love, and it shows him actually painting, the whole process, and, not to compare us to Picasso, but to see all the iterations from the start to finish, several times you could be like, “That’s great!,” but he kept changing and changing until he thought it was done. And with the song, it required those two elements to become what it was. I think that might be a terrible thing for me to reference. But I do find it really interesting to watch the twists and turns you take from concept to finish. So what is the “MMMBop” origin story? Z.H. : “MMMBop” was started as a background part during the making of our previous independent album, called Boomerang. We were looking for background parts for a song, and somebody started singing what became the “MMMBop” chorus. T.H. : It took a while. I.H. : But I’m pretty sure that was the first one or two lines of the first verse. T.H. : There was definitely some push and pull in our relationships, and several friendships where it was, wow, I guess we’re going left and you’re going right, and that’s what the verses were. I really do feel like the secret of that song connecting like it did is that it is more than a pop song. Can you still hit those notes? Was there a moment you had to say, “Okay, that key doesn’t work anymore … “? T.H. : Interestingly, “MMMBop” was actually too high by the time it was recorded for Middle of Nowhere! And we were playing it lower on our first tour. I.H. : There’s a bunch of back-and-forth between Taylor and Zac on Middle of Nowhere, because there are several notes from the original indie record that were not quite achievable by the late summer or fall of ’96. Z.H. : We were going through a lovely time, a time of change! But there’s always been a lot of flipping, trade-offs, on our records, where maybe Tay’s singing a high part and then I am. I.H. : “MMMBop” was originally in the key of A, and we currently play it in F sharp. Sometimes in F. T.H. : You’re getting some serious “MMMBop” details here. Deep cuts only. Have you heard any good covers of it over the years? T.H. : I gotta be honest: No. I.H. : You know why? People can’t sing the chorus right. Most of the time they syncopate it wrong. I.H. : If Bruno Mars were interested, he’d probably find a way to kill it. T.H. : We had a very high-minded concept, and the youthfulness was more suggested than us being like, “Yeah, we wanna go Rollerblading for the video!” At first we actually objected to that whole idea. But we also wanted the feel to be not overly polished. So with Tamra Davis, we said we liked the feel of the Super-8 camera, this super-warm feeling, like being in a living room where we actually might have recorded the record. And when we’re performing in the house, that’s the Dust Brothers’ house where we tracked it. So the feeling of the video was very authentic to what we wanted to interpret. The Rollerblading and surfing part was more like, “So, what are we gonna do for three minutes … ? Uhhh let’s go to the beach!” We’ve heard from many people in bands years later saying, “I saw you guys doing it, I want to join a band, I guess I could.” So I love that about the video. Is it weird to see yourself that young now? T.H. : Um, I still remember the edits. Like, Hmmm, that was a weird cut. And I remember wishing that we could actually drive the car in it. I.H. : I had my license at the time! Z.H. : Like, guys, it’s called suspension of disbelief. We’re also not wearing helmets. Come on. T.H. : What’s wild is that I now have a 13-year-old son. What does your son say when he sees the video? T.H. : Honestly, he’s like, “You did that? Can I do that?” Uhhh, prove it! But Ezra is actually very musical, he plays piano, and he’s very interested in it. So we’ll see —you never know. I.H. : I think he might be able to help play at this point. T.H. : He’s older than I was when we made the “MMMBop” indie record in ’96. That’s pretty insane, and it does change your perspective on what we were doing, getting that album going, getting signed, and starting to tour.